I've noticed something different with the HTC One: people are actually excited about it. I can't say that I've ever seen such a response to an HTC phone in recent years, so that's a good thing. This phone is hitting the scene at a crucial time for HTC, and with people calling it "the best Android phone" in existence right now (or even this year), it could be the saving grace needed to pull the company from its recent slump. It's going to have some stiff competition from Samsung's Galaxy S 4, but considering 61 percent of our readers said they'd take the One over the S4, things are definitely looking up for HTC. And today, you can make good on the "I'd rather have a One than an S4" promise – the device is available nationally on both Sprint and AT&T starting now. It'll set you back $200 on The Now Network for the 32GB version (which appears to be the only one available), but if you're making the jump from another carrier and port your number over, they'll knock another $100 off instantly. 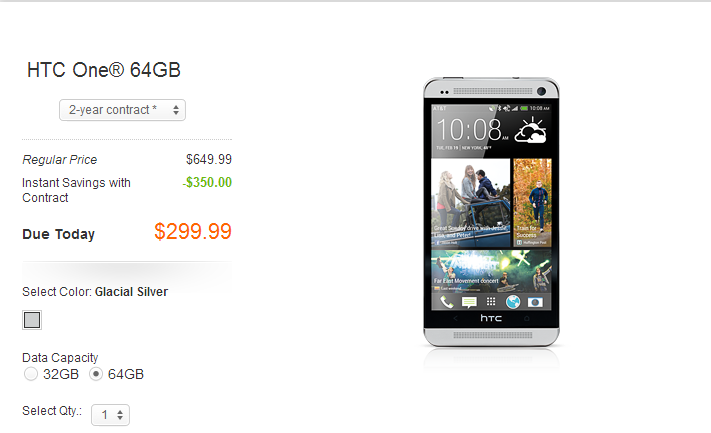 Not a bad deal for one of the top phones in the scene, eh? On the AT&T side of things, the 32GB will cost you $200, while the 64GB variant is going for $300. All of those prices are, of course, with a two-year agreement. If you've vowed your loyalty to HTC and the One is the one for you, pick your poison below. Update: Well, what do you know – T-Mobile just confirmed that what we spotted earlier today was not a pre-order, and the One with a free car dock is indeed available online beginning today and will be in stores on April 24th. You'll have to throw $100 down, and the remaining balance will be spread across the following 24 months at $20/month. Of course, you can always pay it off sooner if you like!